It’s no secret that choosing a new garage door can be daunting. The process can even feel quite overwhelming, simply because there are so many styles and types to choose from. Additionally, there are other factors to consider such as choice of materials and price. The care in planning is certainly worth it, however, as study after study shows that the right choice in a new garage door provides one of the highest returns on investment you can make for your home. That’s because of the enormous curb appeal improvement you gain when you choose a garage door that complements your home’s architectural design. Your garage door provides an opportunity to make a positive, memorable first impression. Choosing the right material for a garage door is an important part of the process. It might not be obvious from the street if your door is made of steel or aluminum, but the structural differences will certainly be noticeable to you in the long run. Today’s metal garage doors are a dead ringer for classic coach-style wooden garage doors, but they come with huge performance advantages, including low maintenance and high visual impact. Although purchasing a new garage door is one that most homeowners will only encounter several times in their lives, you do want to be reassured that your decision is the right one. Fortunately, if you work with the right garage door supplier, your odds of making the right choice drastically improve. A recent release by the Cost and Value Report, in conjunction with the National Association of Realtors, verified that residential garage door replacement has the best overall return on investment for residential homes. Buying a new garage door topped the list: and for good reason. With a new garage door, it’s easy to see how home value can increase by choosing a product that suits your property. Take the time to stand back on the street and study your current garage door. Does it accent and amplify first impressions of your property? Or does it make a bit of a sad, depressing statement? It’s interesting to reflect on why garage doors make such strong statements about your home and its perceived value. In most homes, the garage door is a prominent architectural feature. Many garages lead the building’s face, rather than recede from it. For example, consider a typical 16’ by 8’ subdivision garage door, compared to a 3’ by 7’ front entrance door. The garage door is 128 square feet, and the entryway is only 21 square feet. That makes the garage door exposure six times larger, and much more visible. It’s a standard architectural principle that front entryways are supposed to be inviting and pleasing. You may have a great front door that’s a feature of your façade. But, you might also one of many who has a fairly standard garage door: a product of mass construction, and a reflection of significant growth that’s occurred in the last thirty years. Fortunately, garage doors can be replaced, and improvements can always be made. In fact, purchasing a new garage door can enhance your personal pride and well-being in addition to the exterior improvements that it provides to your residence. A new garage door is a worthwhile investment. One of the best tips for buying a new garage door is to consider the primary uses of your garage. Do only use your garage to park your car? Or, do you use the space for a variety of other purposes, like storage or a game room? A common desire for a home’s garage space is that it will provide options for any preferred use. Sure, a car or two might be parked inside and out of the weather. However, many families choose to keep recreational toys and vehicles in their garage like bicycles, scooters, motorcycles – even watersports equipment like jet-skis and boats. In addition to functioning as a large storage space for your vehicles, garages are popular spots for beer fridges. They can be a place where seasonal clothing hangs out. The possibilities are virtually endless. 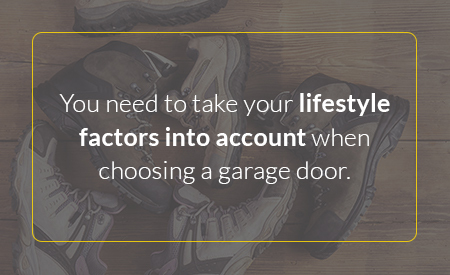 You need to take your lifestyle factors into account when choosing a garage door. Any tips on buying a new garage door need to include asking yourself how you actually use your garage. Are safety and security a serious issue? In that case, you need a garage door that’s strong and offers privacy. If you use your garage as a workshop, then natural light is a big concern. You’ll want a door with plenty of glass to keep your workspace bright and welcoming. If you need temperature control to protect items from freezing, an insulated garage door is a must. The same goes for soundproofing. Your neighbors might not appreciate the kid on the drums or the sound of your power tools hard at work. Whether you use your garage in the winter should impact your decision, as well. Heated garages are popular in cold climates. Not only can a well-insulated garage door keep the cold out, but it can also help to prevent expensive heat loss. The same considerations apply to hot climates, in which summer’s excessive heat needs to be insulated so the garage space can be cooled. Quality-built garage doors like those from Clopay have an excellent return on investment. It’s important to think of your garage door operation in terms of cycles. 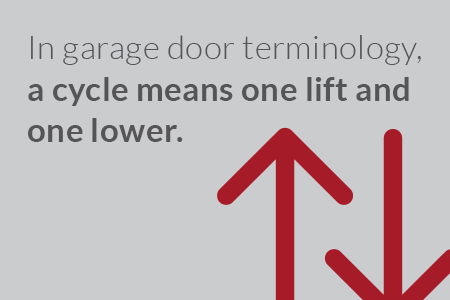 In garage door terminology, a cycle means one lift and one lower. That represents each time you go in and out your garage door: whether it’s moving your car, or transporting materials in and out of your shop. For most people, their garage door cycles multiple times a day. Many homeowners use the garage door as their primary entrance and exit. Their elegant entry door is rarely used – except to receive special guests. It’s a fact that every garage door, no matter how well built or expensive, has a certain lifespan with limited cycles. There is wear and tear on the springs and rollers, as well as stress on the hinges and rails. There’s also wear on your garage door opener. If you only cycle your garage door twice a day, which represents taking your car out and putting it back in, you’ll have about 730 cycles per year. Double that, and you’ll have nearly 1,500. For some American households, this may even be on the low end. Leading garage door manufacturers like Clopay rate a typical garage door lifespan to be 20,000 cycles. That means most garage doors will need to be replaced every 13 years. Of course, this also depends on proper use, care, and maintenance. The applications of your garage, and how many yearly cycles you anticipate needing, is a vital consideration when choosing the best material for a garage door. Your desired curb appeal is equally important, as you need that return on investment to protect your property value. A proper investment should include a long lifecycle that’s problem-free and provides everything you need from a residential garage door replacement. You’ll get true value and return when you choose the right material for your new garage door. There are several styles and choices of materials when it comes to garage doors. Wood garage doors are attractive and appear high-end, but they have associated problems. Steel and aluminum garage doors are the most popular choices. And then there’s the choice between insulated and non-insulated garage doors. Steel garage doors have the largest market share. It’s hard to beat a steel door when examining all-around performance and value. Steel is durable and long-lasting. Its strength stands up to flying hockey pucks and balls that dent and ding the finish. Steel also tolerates thousands of garage door cycles that shake apart lesser materials like wood, vinyl and fiberglass. Although steel garage doors are incredibly strong, they’re relatively inexpensive. That makes steel a great choice for garage doors that need to be tough, but still budget friendly. The term “tough as steel” is no understatement when it comes to describing steel garage doors. They’ve been used for years, and will likely always be the leader in garage door sales. Steel garage doors are available in different thicknesses or gauges. Unlike many other product ratings, the thicker the steel, the lower the gauge number. Twenty-eight-gauge steel is relatively thin and lightweight. These thin-gauge garage doors excel when used in a lighter-duty application where span and height are limited. Bigger doors benefit from thicker steel like 24-gauge. This is a better choice when insulation is a factor and you require thicker steel to support the extra weight. Steel garage doors stand up well to the elements. They take high winds in stride, which is important in areas at risk of hurricanes and tornadoes. Steel doors won’t crack, warp or twist like wood garage doors tend to. Rain, snow and ice damage is limited with steel, and rusting is a thing of the past due to today’s high-tech finishes. Most steel garage doors have impervious finishes. Many have baked-on enamel applied at the factory that offers the buyer years of maintenance-free service. Factory finishes on steel doors are easy to clean. They only require an occasional hosing down, or a quick brush with soapy water. Yellowing or fading is also a thing of the past, as exterior finishes have UV protection that resists full sunlight. Steel doors can benefit from the application of custom paints and stains. You can match your steel door to the exact color scheme on your home. Many steel garage doors have woodgrain patterns embossed into their exterior skins. Some homeowners choose to stain their steel door, as it gives the door a true wood appearance. Clopay is a leading manufacturer of steel garage doors. They offer a variety of products in a huge range of styles and designs. Some Clopay steel doors like the Classic collection are budget minded, while still being durable and long-lasting. The Canyon Ridge and Coachman series are also steel, but give the impression of classic wood doors. Clopay’s Gallery and Premium collections can also be treated as a wood product, but they remain tough-as–steel, durable garage doors. While aluminum and glass don’t have the same structural strength as steel garage doors, they certainly do have their place. Many homeowners and builders choose aluminum garage doors because they are lightweight and resistant to nature’s elements. Aluminum does not rust or deteriorate in wet conditions. While steel doors have made remarkable advances in durable finishes, there are certain applications in which aluminum garage doors outperform ones made of steel. Coastal climates are a good example of a location where you’d want to consider investing in an aluminum garage door. Salt contact is hard on exterior finishes. Direct splashing by salt water is rare, but ocean spray and the salt-laden air carries far from the shore and settles on garage door faces. Salt can eat away at steel and cause it to prematurely rust. That won’t happen with aluminum garage doors. They stay intact and serviceable no matter what the elements throw at them, excluding high winds. That’s a drawback to installing an aluminum garage door. You might also avoid aluminum as a garage door material where rough traffic can easily dent the soft surface. Aluminum garage doors are a great choice when you install them in combination with glass. The weight and strength ratio makes aluminum ideally suited to support the stress from heavy glass panels. This delivers a balanced garage door that’s easy to lift and puts less cycle strain on supporting components. You might also consider buying an aluminum garage door in places where power outages are frequent. Manually lifting an aluminum door is much easier, and safer, than struggling with a heavier steel or wood product. When fitted with glass windows or panels, steel and wood doors can be unmanageably heavy. Aluminum lightens the load and the stress. For some architectural styles like the popular modern look, there’s no substitute for an aluminum door with glass panels. You can get the look of wood with aluminum doors just like you can with steel ones. Check out Clopay’s Avante series, which makes an unmistakable statement in architecture. It’s the perfect commercial-grade aluminum solution for contemporary homes where glass and strong horizontal lines are important. When garage door insulation is mentioned, you probably imagine cold temperature locations where your garage is heated half the year. Of course, in that situation, you’d want your garage door to be insulated. The colder the climate, the better the insulation, right? That’s not always the case. In hot, humid spots you also want your garage door to be well-insulated. Insulation doesn’t only stop the heat from barreling in. Well-insulated doors keep cool air inside. That’s important for energy efficiency, especially when the air conditioning is constantly on. There are two common types of insulation applied in garage door manufacturing. One is rigid polystyrene, or Styrofoam. It’s inexpensive, and it’s usually glued on the surface after being cut to size from sheets. The second insulation type is polyurethane foam. It’s a much better insulator, as it’s injected in panel spaces and allowed to expand, filling up all gaps. You get what you pay for with garage door insulation. Polyurethane foam is costlier, but it has far better insulating values than rigid polystyrene. This gives a foam-filled garage door superior heat loss and gain properties. In the insulation business, this is measured as an R-value. R-value is the measure of thermal resistance to heat flow. R, or Resistance, is a rating on the insulation’s thickness and chemical properties, such as being made of rigid polystyrene or foam polyurethane. The higher the R-value number, the better the material is insulated. Here, you see that jumping all the way up to R-32 from R-12 is only an efficiency increase of 4%. The takeaway in regard to garage door insulation is that increasing insulation thickness has little impact on overall insulation value. It’s the insulation material that counts. Uninsulated garage doors have virtually no R-value. Many factors determine the value of a residential garage door replacement. The return on investment that you get from increased curb appeal is enormous. The style and materials of your new garage door are extremely important. Lifecycle and insulation level are also critical considerations. But what ties all of these components together is your garage door supplier and installer. The right combination makes a huge difference for your return on investment. Ole & Lena’s experienced team of installers provide homeowners like you with exceptional value in your new garage door. Our years of experience and professional attitude deliver the care and attention you deserve when you choose a new door from our Clopay collections. For a clean, reliable and long-lasting Clopay garage door, call the friendly staff at Ole & Lena’s Garage Door Service today. We’re at 952-888-1110, or complete our contact form.